Even in the NHL, where there is an entry draft that serves to disperse prospects, there is the constant push to recruit and ensure that targeted players, whether drafted or sought after as a free agent, sign an entry level contract and agree to join the organization. This recruiting process takes place year round and, for NCAA-based prospects, heats up early in the spring as collegiate seasons conclude. Cases such Jimmy Vesey, Justin Schultz and Mike Reilly’s illustrate that there is no definite guarantee that players – often college players – are an airtight, sure thing to sign with the team that drafted them once they gain some leverage after their junior seasons. NCAA-based players become free agents in the summer after their senior year should they remain unsigned. 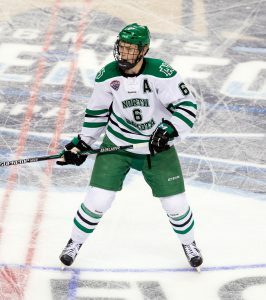 This week, the Los Angeles Kings are expected to restart their push to sign University of North Dakota defenseman Paul LaDue, a sixth round draft pick in 2012, who concluded his junior season by winning a national championship with a 5-1 win over Quinnipiac on Saturday. 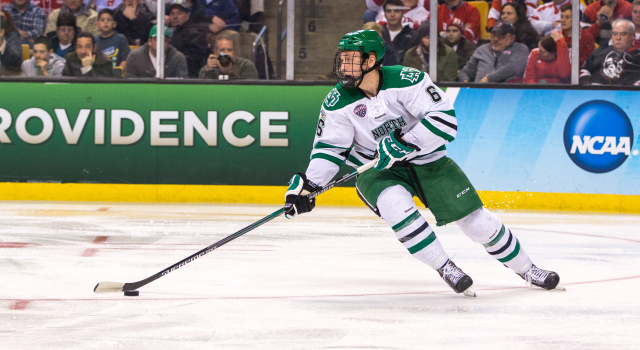 In 123 games with North Dakota, the right-handed shooter totaled 16 goals and 62 points. A Los Angeles contingent including Assistant General Manager Rob Blake traveled to North Dakota to meet with him at the end of his sophomore season one year ago, but was fine with his decision to return to Grand Forks for 2015-16. With the added championship experience and a solid junior year under his belt, the Kings believe that the time is right for LaDue to join the organization, and should pen hit paper, would send him to the AHL’s Ontario Reign. In his third straight 41-game season, the 6-foot-1, 197-pound social science major totaled five goals, 19 points and a plus-31 rating. His uncle, Steve Johnson, won a championship at North Dakota in 1987 and was a Hobey Baker Award finalist in 1987-88. LaDue is a Grand Forks, N.D. native.